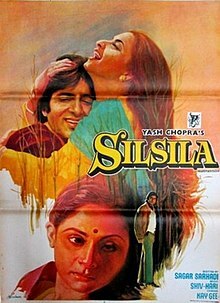 Silsila (Series of Events) is a 1981 Indian Hindi romantic drama film directed by Yash Chopra. It stars Amitabh Bachchan, Jaya Bachchan, Rekha and Sanjeev Kumar. Kulbhushan Kharbanda and Shashi Kapoor make guest appearances. The movie is said to be loosely inspired by the alleged real-life love triangle of its three stars, Amitabh-Jaya-Rekha, the most talked about love affair at the time. On his last birthday, Yash Chopra revealed that he originally wanted to cast Parveen Babi and Smita Patil opposite Bachchan, but after consulting him, he chose to cast Jaya Bachchan and Rekha in their respective roles. This was the last film to feature Rekha with Amitabh Bachchan, putting an end to this popular on-screen pair and their rumored off-screen affair. This was also the last time to feature Amitabh Bachchan with Jaya Bachchan until they appeared together on screen 20 years later in Karan Johar's Kabhi Khushi Kabhie Gham... (2001). After this film, Jaya Bachchan retired from acting and did not feature in any new releases until Hazaar Chaurasi Ki Maa. (1998), 18 years later. The film was a commercial failure at the box office. However, over the years, the film has acquired a cult classic and is today considered one of Chopra's best works. He also said that this film and Lamhe were his favourites. The movie's soundtrack became a "super-hit" upon the release of the film and continues to be popular. Orphaned at a young age, brothers Shekhar Malhotra (Shashi Kapoor) and Amit Malhotra (Amitabh Bachchan) lead independent lives. Shekhar is a squadron leader with the Indian Air Force, and Amit is an emerging writer. Shekhar has fallen in love with the lovely Shobha (Jaya Bachchan), while Amit seeks to woo the attractive Chandni (Rekha). Amit finds professional success as a playwright in Delhi, enjoying a successful launch into the circles of Delhi's intellectual elite. His passion and dedication to his craft win Chandni's affections, and they share a brief, blissful courtship. Chandni's parents prepare to arrange her wedding to Amit. Both Shekhar and Amit plan to marry at the same time, but Shekhar is killed in air combat against PAF, leaving a pregnant Shobha behind. Taking pity on Shobha, Amit marries her and writes to Chandni to forget him. This news breaks Chandni's heart. She goes on to marry Dr. V.K. Anand (Sanjeev Kumar), who is in love with her. Tragedy strikes once more, and Shobha loses her child in a car accident. With no child to bind them together, Amit and Shobha drift apart. Amit runs into Chandni and they secretly rekindle their romance. They meet on the sly until a fateful night when Chandni accidentally hits a passerby on the way home from a tryst with Amit. The police get involved, but Amit manages to hush the matter up. But the secrecy of the affair is endangered by the fact that the police inspector in charge of investigating the accident is Shobha's cousin (played by Kulbhushan Kharbanda), who is determined to expose Amit's affair with Chandni. Soon, Amit decides that he can no longer continue his loveless marriage to Shobha and wishes to reconcile with Chandni. This news shatters Shobha - who had long known of Amit's affair - but she does not lose hope. She believes that if her love is true he will return to her. Similarly, Chandni's husband Dr. Anand is aware of and devastated by Chandni's infidelity. Dr. Anand leaves on a business trip, assuring Chandni he will be back soon, hopeful that she will be there when he returns. Amit and Chandni leave town to start a new life elsewhere, but tragedy strikes. Chandni's husband Dr. Anand's plane crashes, causing the lovers to rush to the wreckage site visible to them from the overhead helicopter they are making their escape in. Rushing into the fray to save Dr. Anand, Amit is confronted by Shobha, who in a moment of turmoil reveals that she is expecting his child. When Dr. Anand is rescued from the wreckage, Chandni realises her love for her husband. The film ends with a song depicting Amit and Shobha living happily in marriage and an end title saying, "Love is faith and faith is forever". The music for the film was composed by Shiv-Hari, and the lyrics were written by Javed Akhtar. The song "Rang Barse Bhige Chunar Wali" is said to be one of India's best known folk songs. Its lyrics were by poet Harivansh Rai Bachchan. The song "Dekha Ek Khwaab" was shot in the Keukenhof tulip gardens in The Netherlands and some parts in Pahalgam. According to music expert Rajesh Subramanian, the tune of "Neela Aasman So Gaya" was actually composed by Shammi Kapoor. Kapoor made Bachchan hear it on the sets of Zameer. Bachchan suggested it to Yash Chopra, who incorporated it in Silsila. The lyrics of "Tun Hoti to Kaisa Hota" were taken from the poetry collection "Banjara" by Javed Akhtar. Silsila did not do well at the box office, grossing ₹70 million (equivalent to ₹1.1 billion or US$15 million in 2018), but has since achieved a cult status among Indian audiences. It launched Shiv Hari as a commercially successful duo, and its songs continue to be remembered and heard in India. ^ "Smita Patil, Parveen Babi original choice for 'Silsila': Yash Chopra - Indian Express". www.indianexpress.com. ^ "Yash Chopra wanted to cast Smita Patil, Parveen Babi for Silsila". ^ Mishra, Vijay (2002). Bollywood cinema: temples of desire. Routledge. p. 153. ISBN 978-0-415-93015-4. Retrieved 28 February 2011. ^ Silsila: Soundtrack Internet Movie Database. ^ "Kuekenhof – Netherlands". Archived from the original on 20 March 2012. Retrieved 26 May 2011. ^ "Movie Locations for Silsila". ^ Shelatkar, Prasanna (25 March 2016). "Tum hoti toh kaisa hota (original poem) by Javed Akhtar". Kolkata literary meet 2016. ^ Ganti, Tejaswini (2012). Producing Bollywood: Inside the Contemporary Hindi Film Industry. Duke University Press. p. 284. ISBN 9780822352136. Retrieved 24 January 2012. ^ "Silsila - Starring Amitabh,Jaya,Rekha,Sashi Silsila's box office, news, reviews, video, pictures, and music soundtrack". Ibosnetwork.com. Retrieved 14 March 2012. ^ Subhash K Jha 27 June 2011, 11.43am IST (27 June 2011). "Silsila, Lamhe are my favourites: Yash Chopra - Times Of India". Articles.timesofindia.indiatimes.com. Retrieved 12 October 2012. ^ "Exotic and irrational entertainment: Forbidden Love: Silsila and Lamhe". Exoticandirrational.blogspot.in. 9 June 2008. Retrieved 12 October 2012.